Move over home brew. There is a healthier drink "grow your own" fans can create in the kitchen. Kombucha, made from a live symbiotic culture of bacteria and yeast, is one of the country's fastest growing health trends. Kombucha (kom-BOO-cha) is a tart-tasting fizzy beverage made by fermentation. Its sweet, tangy flavour and low sugar content have made it a popular alternative to sugar-laden soft drinks. Kombucha is made by adding a scoby (symbiotic culture of bacteria and yeast) to a solution of sugar and tea. During the fermentation, the bacteria and yeast on the scoby ferment the tea and sugar to make a sour-tasting tonic. As the scoby grows, it can be broken off into sections to start a new batch. Due to its gelatinous, blob-like appearance, the scoby is also referred to as a mother culture, tea beast, fungus or mushroom. Kombucha has long been popular among home cooks and underground food networks. But it is becoming more readily available through retail outlets. 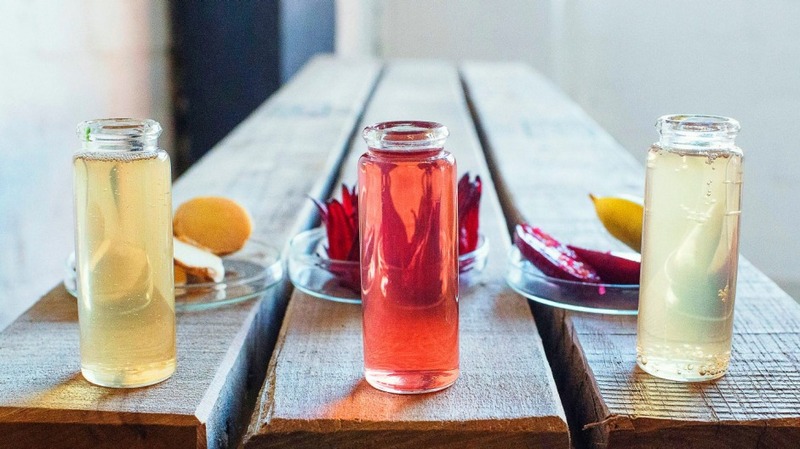 Kombucha has a deliciously sweet, tangy flavour. It is cheap and easy to prepare and there is enormous scope for flavour variation – from herbs and spices to fresh fruit and even a slow-fermented kombucha champagne. 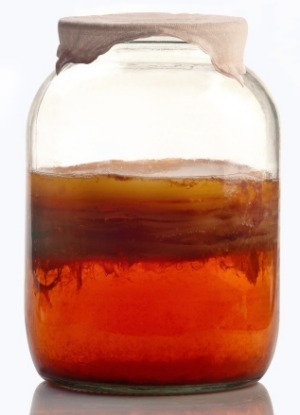 When the scoby ferments the sweet tea solution to make kombucha, it produces several useful compounds. These include beneficial acids such as acetic acid, commonly found in vinegar, which can help control "bad" micro-organisms within the gut. Kombucha also contains B vitamins, folic acid, tea polyphenols and antioxidants. It is often referred to as a source of probiotics, but the amount of probiotic bacteria within kombucha brews can vary. It contains several components (acids, enzymes, bacteria and yeast) that can influence the health and balance of gut microflora. It can easily be made at homewith a starter culture (scoby), tea and sugar. 1. Add the water and sugar to a large saucepan and simmer until the sugar is dissolved. Remove from the heat, add the tea and allow it to rest for 30-60 minutes. 2. Remove the tea bags, and allow the solution to cool to room temperature. Pour into a large, sterilised glass vessel and add the scoby and kombucha liquid. Cover with a tea towel and secure with string or a rubber band. 3. Keep in a warm, dry place (the preferred temperature for kombucha brewing is 24C-32C) away from direct sunlight. Leave undisturbed for a minimum seven to 10 days. 4. During this time, it will grow a baby scoby on the top of the liquid. It will also develop a sour, tart flavour as the scoby consumes the sugar. 5. When the sour flavour is well developed, strain the kombucha liquid from the scoby using a coffee filter or plastic sieve (do not use metal). Keep the scoby, along with one cup of the liquid for a subsequent batch, and either drink the remaining liquid or ferment into a "flavoured booch". 1. Combine the kombucha liquid with the pineapple and ginger and stir well. Place in glass bottles and refrigerate overnight. 2. Serve with ice and fresh mint leaves. Many online and retail outlets, such as The Raw Food Store and NourishmeOrganics, sell kombucha scobys. You can also ask a friend who regularly brews their own kombucha if you can have a portion of their scoby once it has doubled in size. The scoby will develop a shiny, gelatinous texture as it grows. Be sure to discard any batch that develops mould. This is usually the Aspergillus species and can be harmful.